You can do a lot on an iPhone these days: stream online radio, watch videos in high-def, play games that are as addictive as anything on the Xbox 360. One thing you can’t do very well: edit documents, fiddle with spreadsheets, or whip up a PowerPoint presentation. 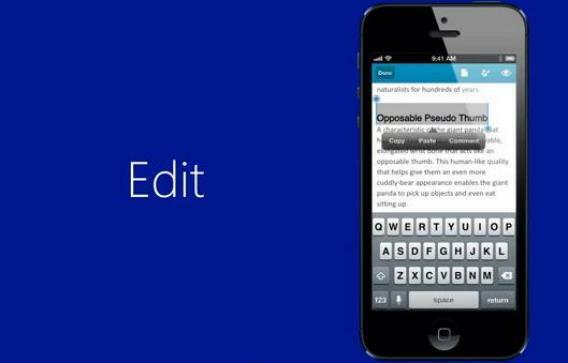 Riding in to address this problem approximately six years late, Microsoft announced today that it has launched an Office app for the iPhone, available at no extra charge to those with an Office 365 subscription. Those without will have to pay a nice round $99.99 for a subscription. Here is a bold prediction: If you subscribe to Office 365 and download this app, you will find that your iPhone is still an exceedingly poor tool for editing documents, fiddling with spreadsheets, and whipping up PowerPoint presentations. Tech writers who have not actually tried the product seem pretty jazzed about it. But those who have are not quite so sanguine. The Verge’s Tom Warren found it “confusing to say the least.” ReadWriteWeb’s Brian Proffitt called the experience of editing an Excel spreadsheet “painful.” While the app works sort of OK as a document viewer, he added, “if you are under the impression that you will be able to generate a ton of Office documents on the go with your iPhone, think again.” Looking for something nice to say, Gizmodo’s Ashley Feinberg observes that the outline template in Word “is great as long as you only have two main points to make.” But, Feinberg cautions, “creating a totally new document from nothing is a clunky process you’ll want to avoid except in the most extreme of circumstances.” Maybe the X-Games can add an “extreme document creation” event to next year’s lineup. Industry watchers are excited about what all of this means for the evolution of Microsoft Office as a “platform-agnostic” service, particularly given that Apple will get a cut of any Office 365 subscription that someone buys through the App Store. That’s all very interesting from an MBA-case-study standpoint. But maybe the reason it took Microsoft six years to release Office for iPhone was less about grand strategy and more about the simple fact that the iPhone was, is, and always will be a terrible platform for Office. Not that the experience on Windows Phone is much better. In general, important documents and tiny buttons are simply not a good match. Can’t wait to see what they come up with for Google Glass.